Ever since I can remember, my favorite food in the world was pasta with pesto sauce. At home as a little girl, they would make this dish every year for my birthday, when I was sick, and any time they wanted me to feel special and loved. It was a big surprise when I found out, I don´t remember exactly when, but right around the mid years of childhood, that what I had known as “pesto” and had held so close to my heart and cravings, was not the real deal, but a Peruvian adaptation of the Italian bestseller. I found myself at that tender age on a culinary crossroad, having to decide whether to be faithful to the flavors that had brought me so much joy, or stick to the name of the dish that had already become a part of my identity. Being a food snob in the making, (and some could say, a traitor), I picked the name. Since then, birthdays and other special events in my life were accompanied by warm dishes of spaghetti al pesto (the original), and my beloved ex favorite dish was banished from our kitchen for many years to come. In my defense, I did love the real pesto, and my mom makes the best one I’ve tried. But years after re-adapting my taste buds, I started yearning for my old childhood friend. When I moved abroad, amidst supermarket isles full of Italian pasta sauces that came in every color and texture, and where our version of the classic was nowhere to be found, I missed it dearly, and I started feeling a new kind of appreciation for it. The story behind the dish? Pesto was first brought to Peru by Italian immigrants from Liguria, which is known to be the cradle of this popular sauce and boasts of having the most aromatic basil in the world. 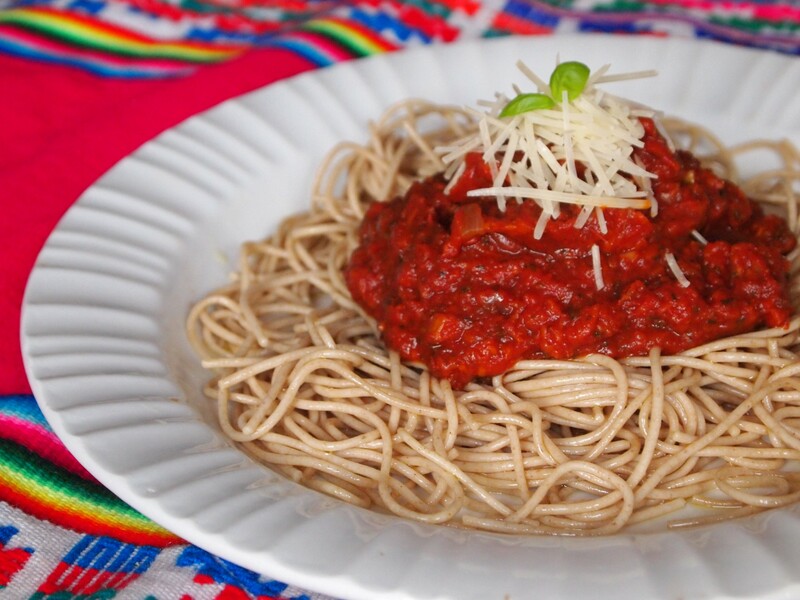 Their simple but exquisite gastronomy had a permanent influence on Peruvian cuisine, and the original pesto ligure became the popular tallarines verdes (green noodles), just like the pasta al pomodoro became known as tallarines rojos (red noodles). Every household and market vendor has its own favorite variation, where the dish is crowned with anything from a fried egg to a piece of steak, or served with French fries on the side. I like to eat them with steamed green beans, like I do with pesto, and use wholegrain rice, or quinoa pasta to keep it healthy. Want to raise the health bar even higher? 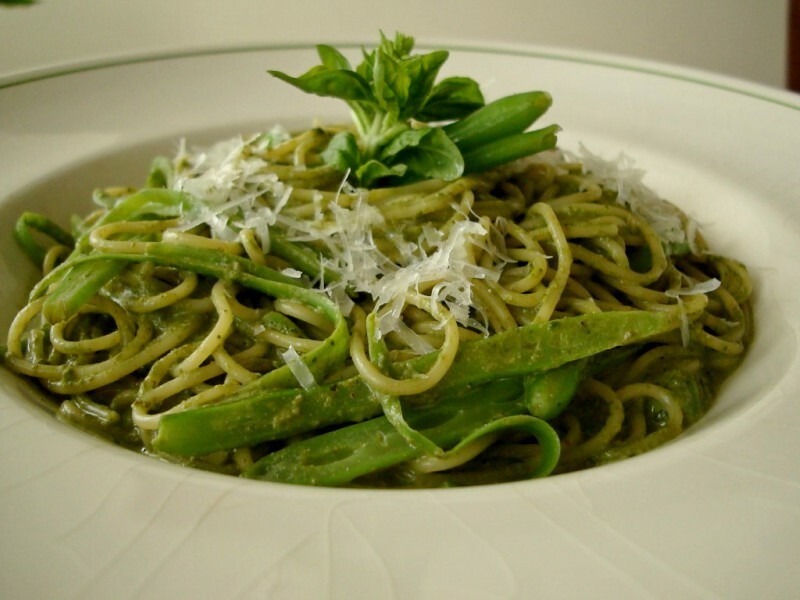 Try mixing in some steamed or slightly sauteed zucchinis, asparagus, fava beans and peas. I once did a vegan rendition substituting the milk with soy milk, and the cheese with tofu, and it had nothing to envy from the original dish. 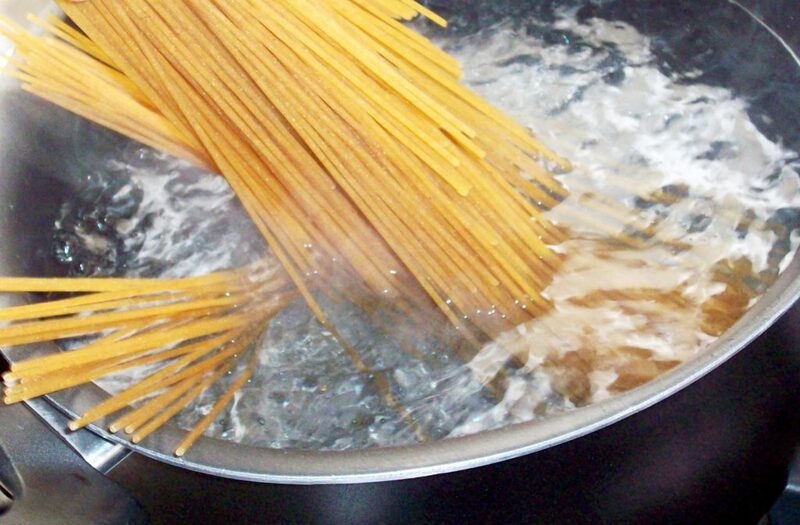 *Cook the pasta in boiling salted water following the package instructions. *Meanwhile saute the onion in 1 tablespoon oil, at medium heat and stirring occasionally, until translucent (about 10 minutes). 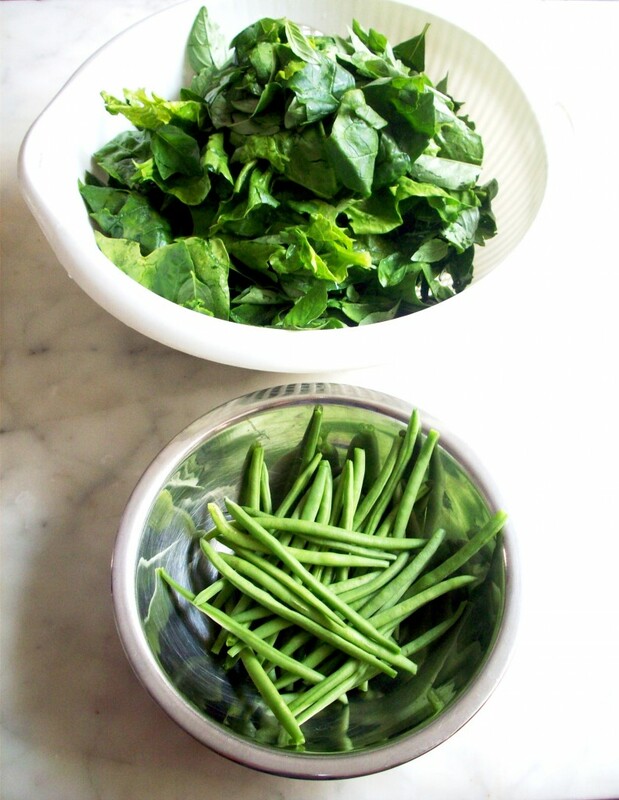 *Pour boiling water over the spinach and basil leaves (you can use the same water for the pasta). Strain. 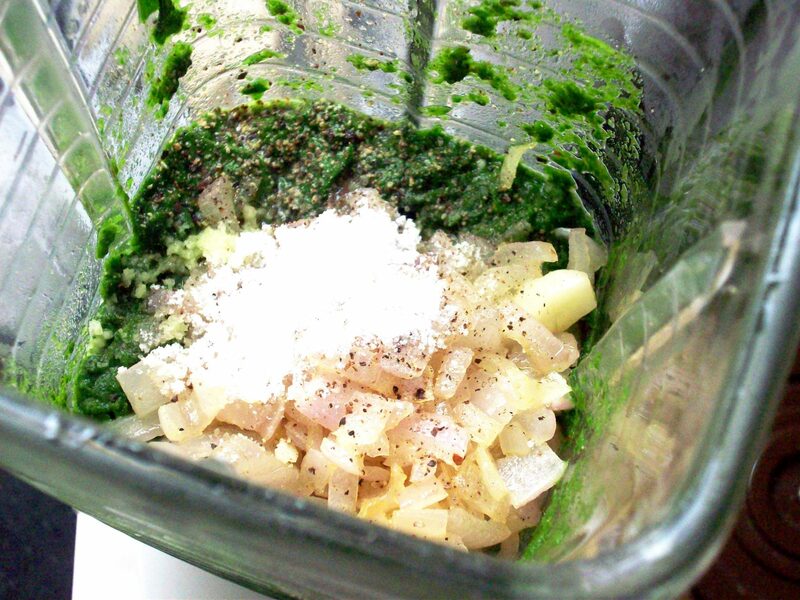 *In the blender process onion, spinach, basil, garlic, evaporated milk, white cheese, pecans, olive oil, salt and pepper. *Drain the pasta and mix with the sauce and the green beans. Serve immediately, sprinkled with Parmesan cheese. My abuelita used to make this dish for me years ago and I never thought to ask her what it was called. My mother (not Peruvian or familiar with anything even remotely Peruvian save my father) always insisted it was called lomo, which I found out not to be the case when I finally visited a Peruvian restaurant. However, I was really excited to find out that I’d been making my own vegan version of tallarines verdes for years, thanks to a garden overflowing with both spinach and basil. 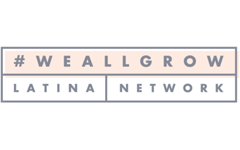 Anyway, I just stumbled across your site by accident and am over the moon excited! I have only visited Peru once, but I grew up listening to my father’s descriptions of the food he ate the first 17 years of his life in Lima. His stories influence the way I cook, but no one in my family ever thought to record abuelita’s recipes, so there’s been a lot of trial and error in my kitchen. I look forward to digging into your recipe archives. Keep trying, Monika. And if you need any help just let us know. Thanks for visiting. This is a really good recipe. Follow the directions and you can’t go wrong. Be sure you serve it with real parmesian cheese on top. Peruvians sometimes serve it with grilled skirt steak on the side. I substituted grilled London Broil sliced thin before serving. Ive had this dish many times in Peru and here at home in the US. My Peruvian girlfriend makes it too, and this recipe here rivals all. Thanks, Tom. We´re happy you like our recipe. You can serve a breaded steak with it, and some people add chicken! Love this dish , my mom also boil potatoes then sliced them and fried it , side with thin steak with a lot of bread crumbs fried (also call beefsteak apanado) , do not forget the green beans and enjoy it!!!!!!!!!!!!!!!!!!!!! Sounds amazing. We should add those papas doradas to the dish. Thanks for visiting and for the tips! I love your site and especially the veggie versions of the recipes! I’m British but lived in Peru on and off for 17 years, all of which time I was vegetarian and raising veggie kids. I have evolved many vegetarian versions of Peruvian recipes but here are some new ones to me and twists and substitutions I hadn’t thought of. I really appreciate your creative approach. Thank you so much! Hi! This is the FIRST time I’ve heard of someone else, raised with “tallarines verdes” and thinking that it was just my Peruvian mom’s way of saying Pesto. Every time I would go to a restaurant, or to anyone else’s house, they would make “Pesto” but it was NOT MY PESTO! … Today, 22 years old, in college, and hungry – I’ve decided to make myself the Tallarines Verdes, but not the pesto that everyone thinks I want. I want MY pesto. so I set forth on an interweb adventure to find the answer to my curious “Peruvian Pesto” and I had it in about 15 seconds – thanks to your site. Also, THANK YOU for the little history lesson about the italians bringing over this culture dish to Peru. My family are among those that left Italy for Peruvian gold (consequently leaving Peru for America 3 generations later). Now I will enjoy this dish even more having learned about its history, connection to my past, and the intense 15 second google search (just to work up the appetite). Bon Appetit & Buen Provecho ! Thanks for sharing your story with us, Nicolas! 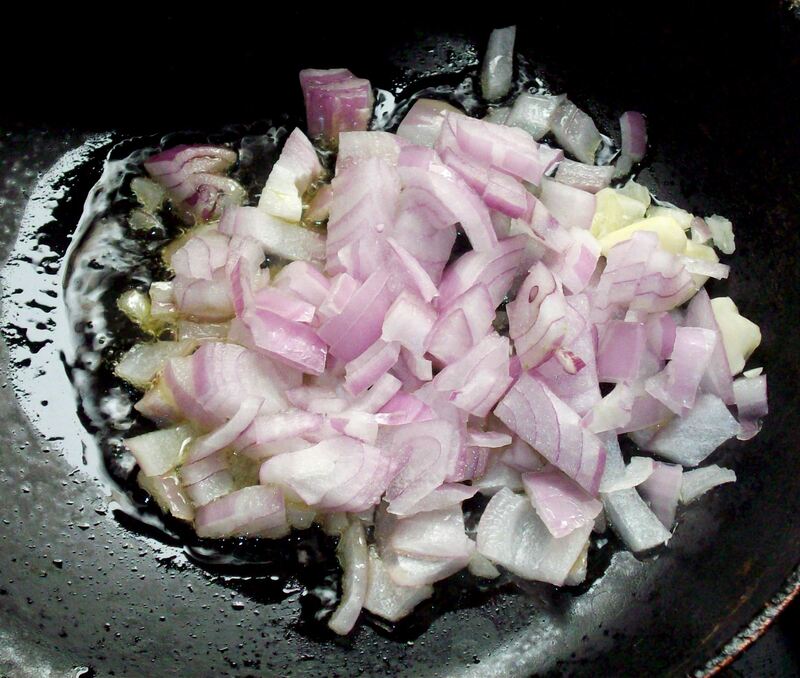 We are happy that you found the recipe you were looking for.